Using paper mache to make an angel is ideal because it is easy to make and work with. Paper mache adheres well with paint and basic craft glue can be used to attach things to this medium. Paper mache paste is made from flour and water, and the paper used is old newspaper, so the process is inexpensive and utilizes recycled materials. Cut the wire mesh in a circle with a round opening in the center and a slit cut from the center hole to the outside. When you are finished, it should resemble the shape of a Christmas tree skirt. Cut the shape of two wings out of the cardboard. You can either cut two separate wings or you can cut the shape of two wings connected in the middle. You will be taping the wings to the body of the angle and covering it with paper mache, so you can do which ever is easier for you. Bend the wire mesh into a cylinder shape. Close the seem in the wire mesh with duct tape. The small end of the cylinder will be where the angel's head goes, so once the seam is secure, stand the cylinder up on its larger end. Attach the wings to the body using duct tape to the side of the cylinder at the seam in the wire mesh. This will ensure the seam is in the back of the angel. Mix the paper mache paste. To do this, mix one part flour with one part water. Stir the paste until it is smooth and well blended. You will also need a lot of old newspapers torn into strips approximately one-inch wide. Cover the entire angel with the paper mache. To cover the angel, you will need to dip the strips of newspaper, one at a time, into the paste. Use your fingers to remove excess paste, and then lay the strip of paper over the angel. Use your hands to smooth out the paper as you add it to the angel. When the entire angel is covered in paper mache, let it sit and dry overnight. Glue a foam ball to the top of the cylinder. The foam ball will be the head of the angel. If you do not want to make your own head, you can also use a doll head. Paint the entire angel. The cylinder part is now the gown covering the angel's body. In addition to painting the gown and the wings, you will also need to paint the foam ball to look like an angel face. 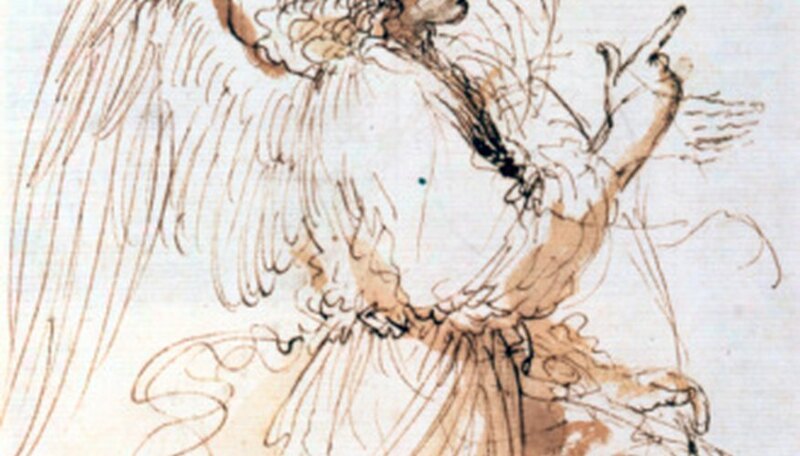 Add hair to the angel's head. You can either purchase a doll wig that will fit the foam ball you used, or you can make a wig out of yarn. You can also cover the body of the angel with material to look like a dress, opposed to painting the body. This project has the potential to be very messy.